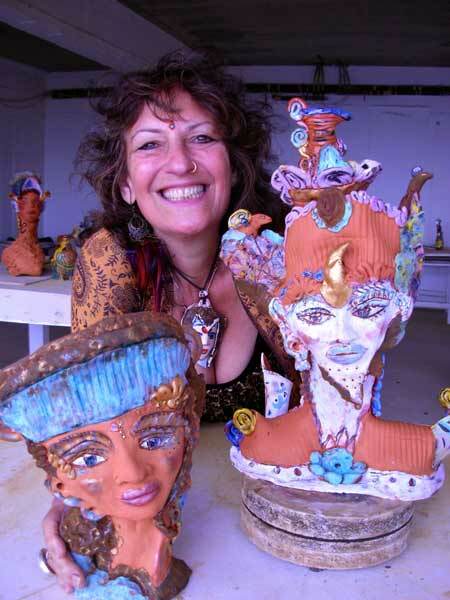 Creating contemporary figurative sculptures amidst the vibrant ancient culture of Greece has become a dream come true, since I began offering ceramic workshops on the stunning island of Skopelos in 2009. This September, I am so excited to be offering my fourth, two-week ceramic workshop at Skopart, building upon the strong relationships I have forged with our local Vancouver Greek community and The Skopelos Foundation of the Arts. As a very young woman “following her bliss” I lived on the magnificent beaches of Corfu and Crete. The beauty and freedom I experienced then have influenced my life choices regarding family, art and teaching. 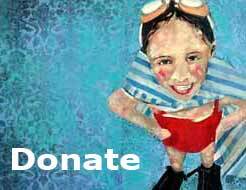 To return to Greece now after three decades as a ceramic artist and mentor, allows me to facilitate for others the inspiration and desire to create that continues to feed my spirit. 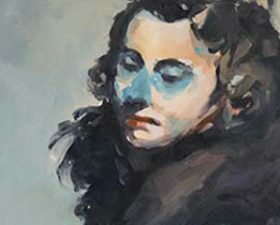 One of the wonderful aspects of attending “Mia Muse” is how people of all ages and levels of life and artistic experiences become engaged with the moment as the cares of their everyday lives drift away. My “Muses” are free to manipulate clay and colour to discover their own voice. They may choose to participate on their own, as couples or even as family groups. The opportunity to create and feel embraced by the evocative ambiance of Greek music, food, artists, museums, beaches, hikes into nature… is truly unique. 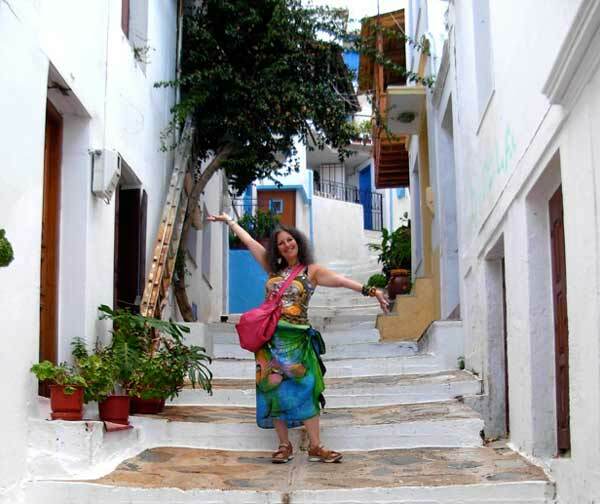 Prior to the workshop on Skopelos, I offer an optional Art/Travel Prelude: a time to bond, become accustomed to a new place and immerse ourselves in Greek Culture. This Aug 21-28th, we will spend the first four nights of our journey on Crete!! Crete is the home of Minoan culture and has always inspired my art. We will visit the Palace and Museum of Knossos, stay in the old Venetian harbor town of Rethymnon, swim in the Libyan Sea by the Samarian Gorge. The next two days will be spent in the romantic old city of Athens. We shall visit the Acropolis, New Acropolis Museum & Plaka, dining alongside the Ancient Agora, before travelling to Skopelos together. 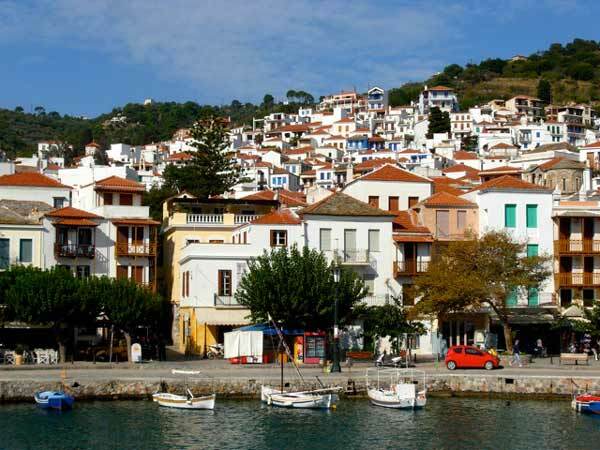 Skopelos Foundation of the Arts is perched upon a hilltop overlooking the scenic, car-free streets of the whitewashed town below. 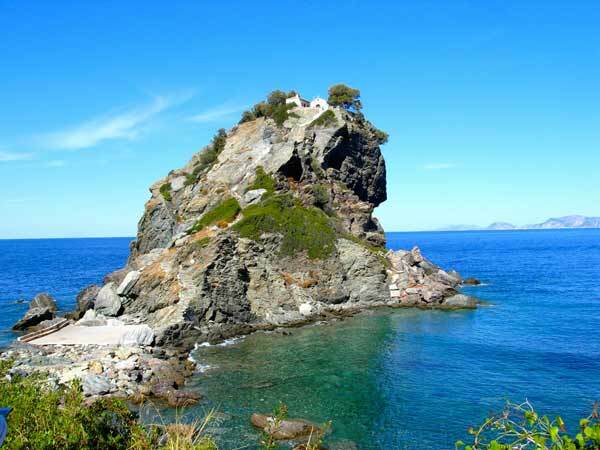 Skopart was founded in 1996 by American artist Gloria Carr, who recognized Skopelos as the ideal place to locate an international art studio. 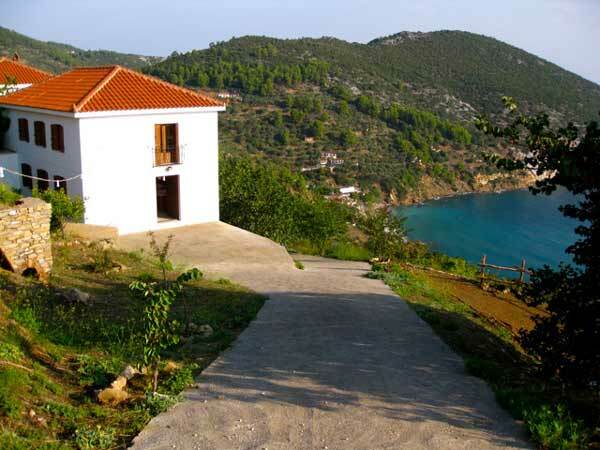 Within three years, Carr had set up an international board and opened a residency program welcoming people from all over the world, eager to learn and create in the stimulating atmosphere of Skopelos. The island gained international attention after the 2008 Hollywood movie “Mamma Mia” was filmed there. In fact, the lovers’ reunion scene filmed on the dramatic ocean side cliff and church at Agios Ioannis is what inspired me to seek Skopart as a location for “Mia Muse”. Carr’s daughter, Jill Somer, joined her mother in 2000 for a visit, and then chose Skopelos as her home, marrying a wonderful islander. Their daughter Zoe, now nine, is a charming and fluently bilingual guide who enhances her family’s close ties to island life. Upon arrival we are welcomed by these three generations of Greek/American muses, followed by a traditional Greek feast, dancing and music. Skopart is a large, modern facility offering printmaking, photography, painting and ceramics. 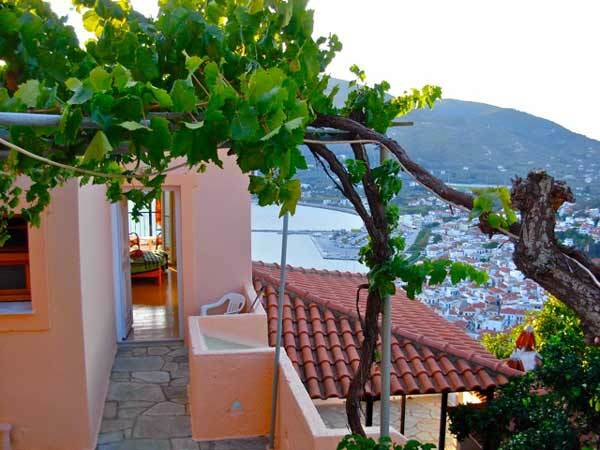 Participants awaken each morning to spectacular sunrise views from our balconies which overlook the remarkably green island, red tile roofs and charming harbour. After a delicious breakfast provided by the Centre, we meet in the ceramics studio, a spacious open air facility. On most days, we spend five hours of structured studio time together. However, students have the option of working as the muse strikes them, 24/7. Using Greek clay and glazes, students create clay sculptures influenced by the vibrant living culture of Greece that surrounds them and the history they have just viewed in museums, galleries and archaeological sites. As I demonstrate and share my personal hand building & surfacing techniques, my artists feel empowered to find their muse, creating figurative, & mythical masks, busts and pottery. Work dries quickly under the Skopelos sun, ready to be kiln fired. 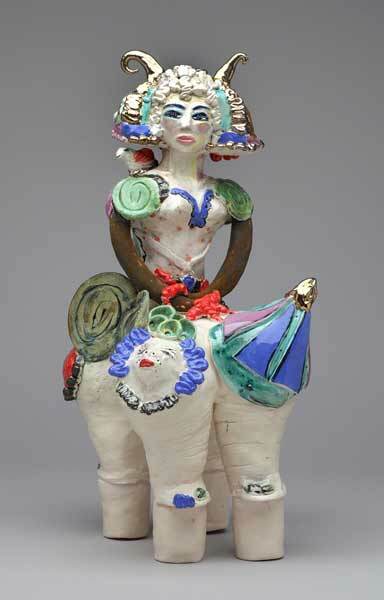 Sculptures are enhanced with a choice of colourful fired and non-fired surfaces. The town of Skopelos begs to be explored, with its winding streets and plentiful, affordable shops featuring local artisans and delicious restaurants. Walking downhill, we are surrounded by whitewashed houses and balconies draped in brilliant bougainvillea with the heavenly scent of jasmine. We visit the many churches and beaches. We climb the incredible cliff site where “the winner takes it all…” from “Mamma Mia” film. Small boats offer day tours to secluded neighbouring islands. My students and I are always delighted to visit the island potters, particularly the celebrated Nikos Rodios, third generation Skopelos potter, who creates classical Greek-style blackened earthenware vessels using island clay and reviving ancient firing methods. In fact, the minimalist black of Nikos’ vessels, in contrast to my own brilliantly coloured and textured ceramic work, sparked him to issue a challenge to me to collaborate with him, to combine my colourful palette with his classical form. The end to each workshop on Skopelos comes only too soon, but we always celebrate our creative journey with a grand exhibit and closing party hosted by Jill and Gloria of SkopArt. The event is well-attended by the local Greek and expatriate community, who are quick to express their appreciation for the quality and variety of the students’ work as well as our contribution to their delightful community. 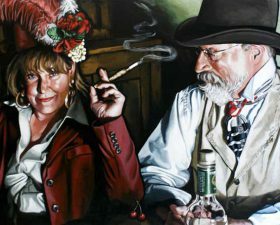 Suzy will be offering “Mia Muse” workshop Aug. 28 – Sept. 12th. thank you Paula, for all that you do. You’re welcome Suzy! I sure wish I was tagging along, sounds divine! I loe Greece and super nice to go with an artistic crowd. have a great trip! i wish you were coming also! that would really make this trip Perfect!! 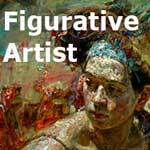 i just sent you an email about my Artist/Workshop FB page. i see you do have this attached to my gold listing. comes up on my personal page – not that one. it’s frustrating – my mistake – becuz i have 2 personal pages and by mistake and can’t merge them. and only one connects with professional page. 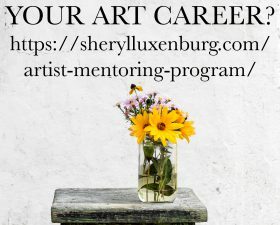 aargg – maybe you can share blog on my artist workshop page as you have time? thanks so so much. Cheers Suzy from sunny South Africa.